It was only after a bouquet of red and white balloons came through the door, that she began looking around for the intended recipient. Woods, of Red Bud, was surprised on Monday, April 15 with the news that she is the 2019 Student Employee of the Year, an honor given by the Office of Student Financial Aid. Approximately 1,800 SIUE student workers were eligible for the award. The award recognizes Woods for her dependability, courtesy, professionalism and ability to exceed expectations. It came with a plaque and a $500 SIUE scholarship. The National Student Employment Association (NSEA) has declared April 14-20 as National Student Employee Week. “Kristen is the perfect person to greet the students and staff who visit our office, and she always does so with a smile,” said Vivian Rodgers, office support associate for the Kimmel Student Involvement Center, who nominated Woods. First runner-up was Cody Rettinghouse, of New Athens. Rettinghouse works for Learning Support Services. Corey Wachter, of Elizabeth, was second runner-up. Wachter works for Campus Recreation. Rettinghouse and Wachter are both third-year School of Pharmacy students. 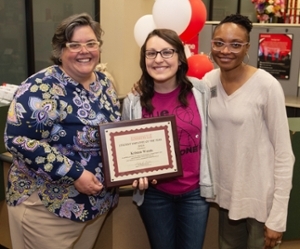 Photo: Kristen Woods (center), a SIUE junior majoring in corporate and organizational communications, was named the 2019 Student Employee of the Year. Congratulating her are Denise Cobb, PhD, provost and vice chancellor for academic affairs (left) and Vivian Rodgers, office support associate for the Kimmel Student Involvement Center, who nominated Woods.